Volunteers are the backbone of the third sector and provide a tremendous resource for nonprofit organizations; thus, it is critical to understand how organizational change might impact their service and contributions. This chapter considers the uniqueness of volunteers in two parts. Part one discusses volunteer motivation and performance management, and retention. 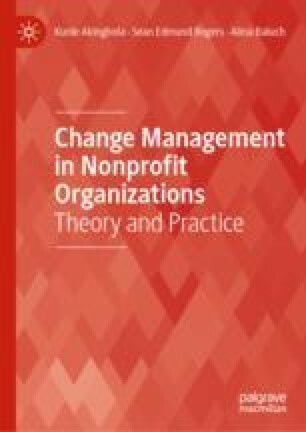 In order to successfully usher volunteers to, through, and beyond change management efforts, nonprofit leaders must clearly understand why volunteers choose to volunteer in the first place, what keeps them volunteering, and how to maximize the value of their service. Part two widens the scope to focus on volunteer management from the perspective of the volunteer administrator and as part of a larger organizational ecosystem. In this second part, we introduce strategic volunteer resource management (strategic VRM) and discuss it as an approach to maintaining high volunteer engagement and maximizing volunteer management impact during change management. AHVRP. About AHVRP. Retrieved September 27, 2018 from http://www.ahvrp.org/about/association.shtml. Corporation for National and Community Service. (2018). Volunteering in America. Retrieved October 7, 2018 from https://www.nationalservice.gov/serve/via. Independent Sector. (2018). Independent Sector Releases New Value of Volunteer Time of $24.69 Per Hour. Retrieved October 7, 2018 from https://independentsector.org/news-post/value-of-volunteer-time-release/.